Join us on Saturday, June 16, at Queeny Park for the 6th Annual Hospice 5K/1K Memorial Run/Walk to honor and remember loved ones. 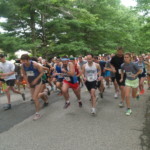 This free community event, coordinated by Bethesda Hospice Care, includes a 5K option (partial pavement and partial gravel with a few hills), or a 1K option (entirely pavement). Other activities include a memorial ceremony, Veterans’ table, children’s activity table, music, and much more.